Taste of Melbourne 2013: Sneak Peak @ Longrain, Melbourne + 2 Double Passes Giveaway!! It’s hard to imagine but another year has gone by and it is time once again for 2013’s Taste of Melbourne event! Based on the success of last year’s outdoor event, Taste of Melbourne (ToM) will once again be held at Albert Park, between the 14th – 17th November 2013. If you haven’t been before and still wondering if this event is worth attending, read our previous years’ round-ups (ToM 2009, 2010, 2011 and 2012). As you can see, quite a few new restaurants lined-up this year which makes for an exciting time ahead. 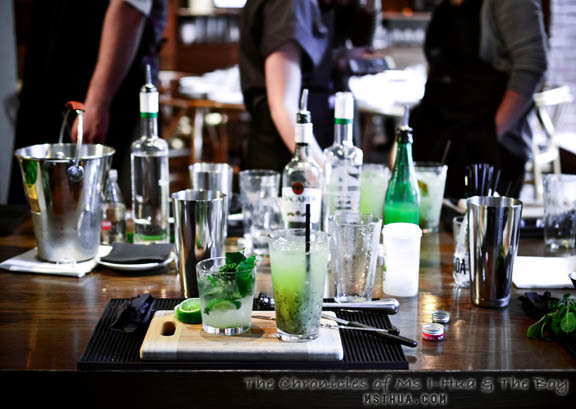 Also making a reappearance at this year’s ToM is the fun and crazy Sensology Cocktail Classes. 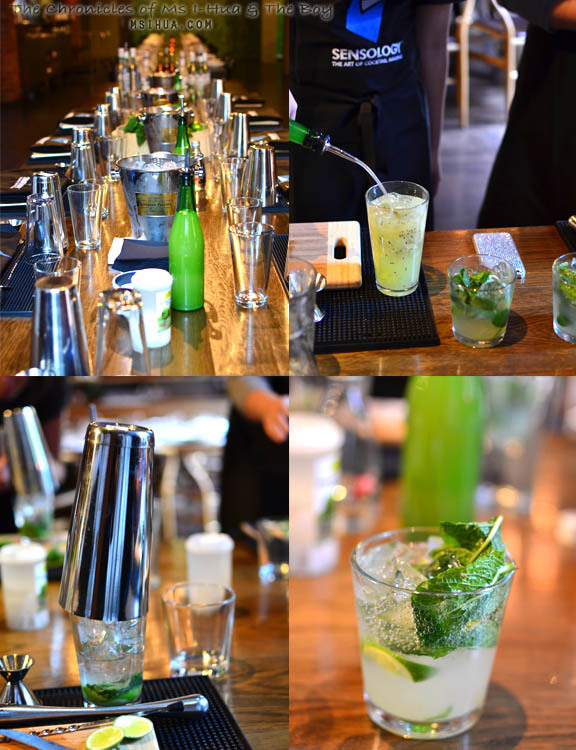 We had a quick snapshot of what to expect when we had the preview ToM session at Longrain last week. Following our mixologist (or bartender’s) ‘Alan from Ireland’s‘ expert guidance, we mixed up a Bacardi Mojito and a Longrain special, Kiwi Coconut Cooler! It was fun and completely delicious. I also managed to get both hands, apron and muddler very sticky once again. How did that happen? (No, don’t answer that :P). From Longrain’s menu, we sampled the delicious treats that will be making an appearance at this year’s ToM event. 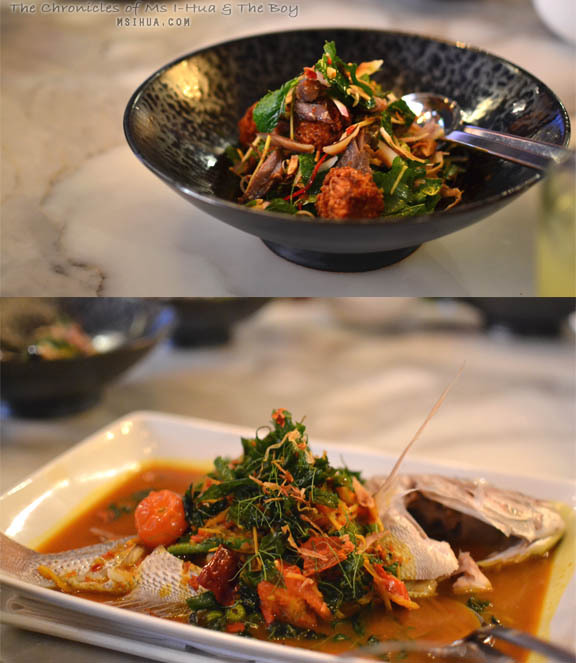 Next on the table was the Hot & Sour Pork Salad (Murray Valley Pork, Rice Balls, Mint, Coriander & Peanuts) as well as Steamed Whole Snapper and Turmeric in a Wild Ginger Broth. During the ToM event, Longrain will replace the snapper we sampled with chicken instead as it’s easier to work with. 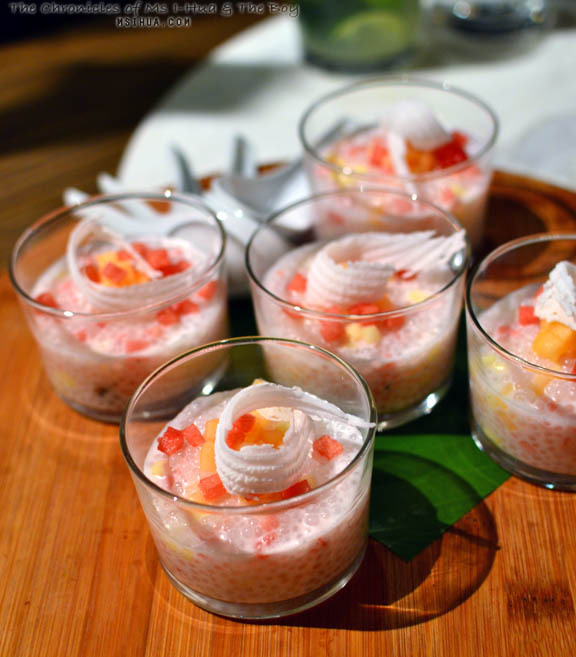 And finally, for desserts we had the Vanilla & Coconut Tapioca with Fresh Fruit. Absolutely loved this and I’m not even a big fan of Asian desserts! Loved how the melons (watermelon and rockmelon) worked so well with the sago and coconut. So with this little sneak peek from Longrain and Sensology, we hope that your curiosity has been piqued. We hoped you are pumped! We have 2 Double Passes to give away (available for any of the sessions) to our lovely Australian readers (if you’re in Melbourne for the event that week) to the Taste of Melbourne 2013 Event at Albert Park! If you are planning on going and haven’t been fortunate enough to win my double passes, why not save time queuing by going online at www.tasteofmelbourne.com.au and pre-purchase tickets, crowns and special offers. What are crowns? Crowns are the currency to pay for the food (works like coupons at a fair; so $1 = 1 Crown). So these are the details you will need to read if you would like to attend the Taste of Melbourne 2013. Start early. Plan your day. Wear loose comfortable clothing Average spend per person (if you’re not too greedy like us) would be around $40-50 per person (entree, main, dessert, and a drink). You could also walk around and sample all the different types of food and wine showcased by the different producers and wine makers. Check the Taste of Melbourne website to keep yourself updated on the timetables and events which are being held. The Taste of Melbourne website has put together a terrific plan (public transport or otherwise) on getting to the event. Look under Getting There on their website. To celebrate this year’s Taste of Melbourne, we are giving away 2 Double Passes valid for all sessions! 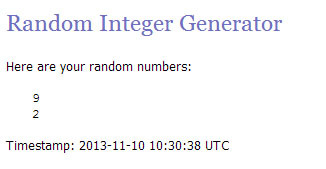 2 winners will be selected and each will receive a double pass. *Please leave a valid email address in the email box (emails won’t be published) as a contact point. Thank you to everyone who took part in this competition. That hot and sour pork salad looks to die for! I’m so excited about this year’s ToM – so many new and exciting restaurants to try out! Definitely on the top of my list is St Crispin… They have definitely got me interested, what with them barely opening for months and the incredibly rave reviews already! I’m still looking forward to try so many of those restaurants on the list. But if I had to pick one, I think I’d have to start with Chin Chin. All the blog posts everywhere, I have to try! Got to admit it’s a delicious list this year but I still find it hard to look past Burch & Purchese. I just know there’ll be many spoonfuls of happiness that’s put a smile on my face. I would absolutely LOVE to go to the Taste of Melbourne this year after missing out last year. There are some absolute gems on offer this year – and the ones I am most excited to check out are Chin Chin’s (I can’t believe I haven’t tried this restaurant yet!) and their Chicken Wings. And I can’t go past Albert St Food and Wine’s Taste ‘Melba’ – I have such a sweet tooth! Bomba’s Braised Pork Jowl cooked in Pedro Ximenez w celeriac would be the first dish I would try at Taste of Melb! It’s been highly raved by bloggers / foodies and would love to taste it! You’ve done it again with your beautiful photos and fantastic recap! It looks like it was an amazing event. 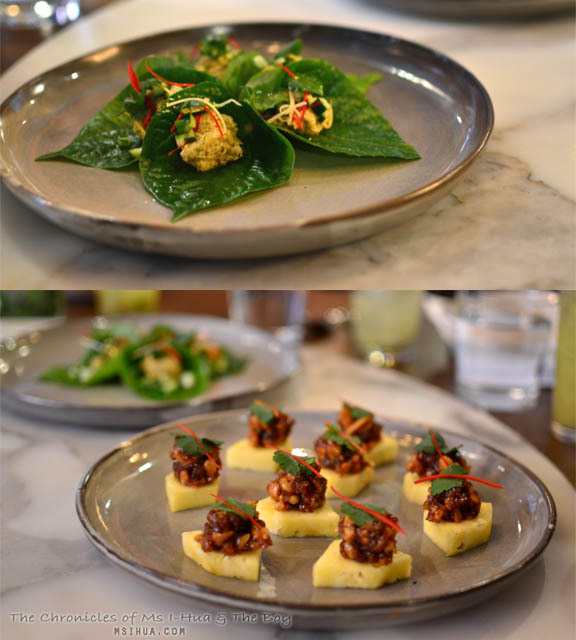 That betel leaf and swimmer crap is killing me – looks divine. I’d say the restaurant I’m most excited about is Tonka. I have a real passion for modern takes on eastern cuisine, and feel that Tonka is doing this extraordinarily well (and having fun with it, which is the best part). Jase and I have just bought a business so are trying to conserve funds at the moment… Tonka has been on our list for months now but we are trying to be as conservative as possible, which means more eating at home, and less date nights out. Taste of Melbourne would be an amazing treat for us to try everything on our list without the stress! Sad to miss the preview but looking forward to Taste of Melbourne this year. Huxtable, I have been wanting to try it for a very long time. But it is an excellent event with a chance to try all the high calibre restaurants listed.